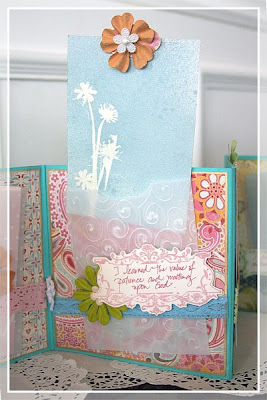 Today I am sharing a mini album that I created using a few colors of the Shimmerz Spritz. 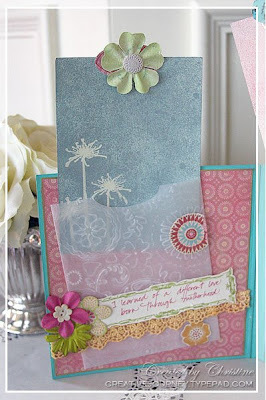 I had such a great time using some of my stamps as masks for the tags in this mini album, and I hope that this inspires some of you to give it a try. The background of the front cover was sprayed with Shimmerz Spritz in Bed of Roses. 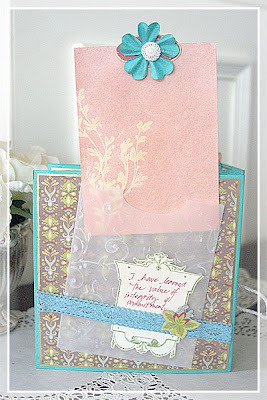 I embossed the cardstock using my Cuttlebug embossing folder and then sprayed it with the Spritz. 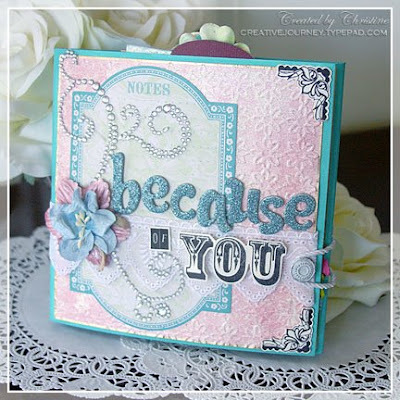 This tag was stamped using a Purple Onion Designs flower silhouette stamp and Versamark ink. 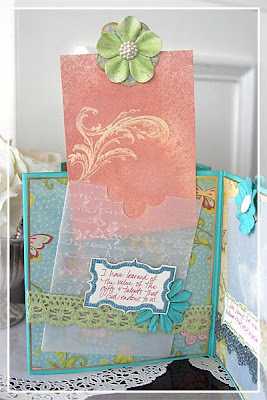 I embossed the image with clear embossing powder and then sprayed the page with Eucalyptus Shimmerz Spritz. I simply wiped away the extra spray from the embossed images using a paper towel to clearly reveal the images. Then I used a heat gun to dry the tag (I'm an impatient crafter...I like to see the finished product faster! LOL! ). 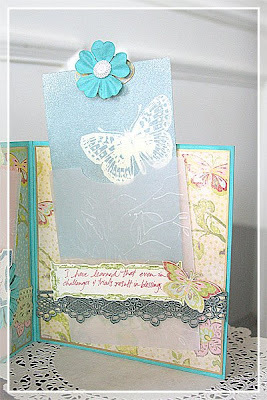 Again, I stamped and clear embossed the stamped heart images and sprayed this page with Bed of Flowers Shimmerz Spritz. Another page that was sprayed with Eucalyptus Shimmer Spritz. This tag was sprayed with Terra Cotta Shimmerz Spritz. It produced a really nice rusty orange color with more applications of Spritz after each time the page was sprayed and dried. Another page sprayed with Eucalyptus Shimmer Spritz (I really like this color! LOL! ). The final page was lightly sprayed with Terra Cotta Shimmerz Spritz, and it came out looking more like a dark peach. 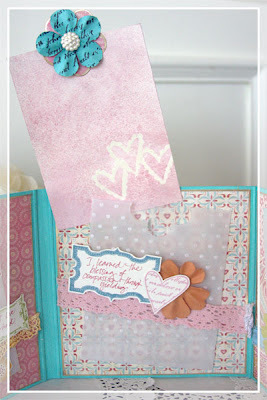 Each of the tags have journaling on the back with a message to each member of our family (my husband and our five children) that expresses what I have learned from each of them. It's a reminder to me of the blessings that they have given to me just by being an important part of my life. Thank you for taking the time to take a look at this project today! Absolutely gorgeous! I love it all. 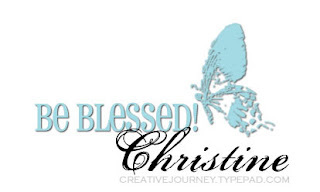 Stunning, Christine!! You do such beautiful work! This is an amazing mini album - thanks so much for sharing!